There is something so magically exotic about Niki Jones’ homewares range, from the bone inlay furniture inspired by techniques used in Rajasthan, to her collection of cushions inspired by traditional Uzbek textiles from north Afghanistan. Niki trained at both the Scottish College of Textiles and the Royal College of Art in London, prior to working as textile designer and style coordinator at Habitat. She then moved to traditional ceramics specialists Wedgwood as design director, before deciding to start her own company because, “I couldn’t find what I wanted to buy online – well designed and well crafted pieces for my home that were a bit special.” Niki’s beautifully unique products keep traditional craft skills alive, supporting developing countries in the process. Niki has somewhat of a cult following, and it’s not surprising. The jewel colour palette and the love that has clearly been put into every piece make the collection hugely appealing – they’re perfect items for anyone looking for a one-of-a-kind addition to their home. 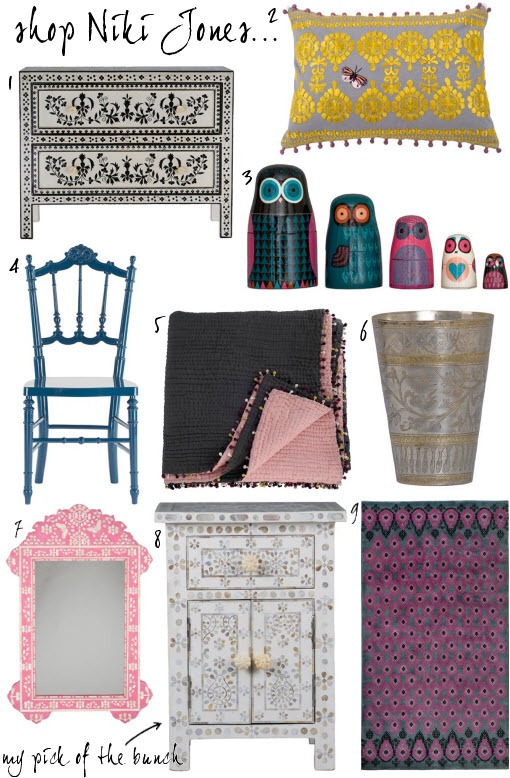 For me, the mother of pearl bedside table is a clear favourite… although I desperately want to give those owls a home too. Which pieces stand out to you? Oh my… these are gorgeous!!! LOVE LOVE LOVE those spice pots and spice jars, I want! How charming are all the cushions too! And the bone inlay furniture, and vintage vessels, and everything! I love it all!